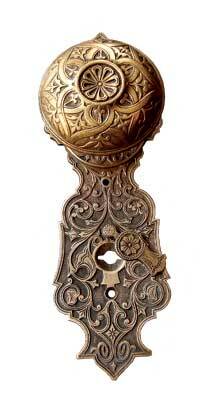 This brass door knocker is a style from the mid-1800s. Getting the details right is more than half the battle to restoring, adding onto, or designing a traditionally inspired home. But the details are often the first design elements to go. Today, many new homes are lacking in subtle details, which add character and charm to interiors. In today’s housing industry, such architectural fine-tuning is all too often left out of the budget, to be replaced by additional unadorned square footage and a great big Palladian window in the front of the house. 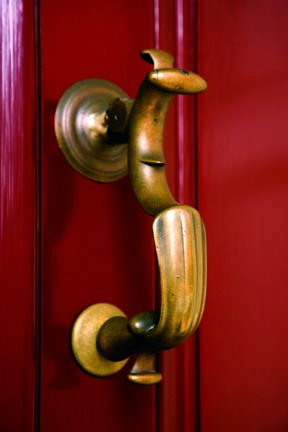 Consequently, architectural hardware is a detail often left to the most inexpensive stock pieces. While getting the details right when it comes to hardware, and keeping your projects on budget, can be a challenge, it can be done. Architects and designers often create a fictitious timeline to give a home the look of a building built over a time. Understanding the historic timeline of architectural details can help decipher what details were popular when, and which are appropriate for your home. Nothing complements the architectural style of a new old house or an old house better than period door and window hardware. 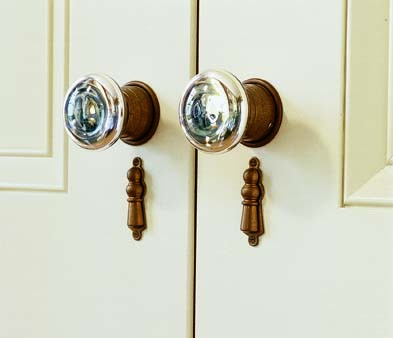 Whether it’s vintage, reproduction, or custom hardware manufactured by local artisans, period hardware provides character, form, and function in equal measure. Once a beacon for the progression of architectural styles that began in America with the geometry of Charles Eastlake and graduated through the excesses of Victoriana, the sparser Arts & Crafts style, and the acute angles of Art Deco, hardware took a misstep in the mid-twentieth century and has been fighting its way back into the public’s consciousness ever since. Today, it is often sidestepped, or even forgotten, by contractors in their door and window specs. As a result, homeowners are left either uninformed or overwhelmed by the quantity of choices, styles, and finishes available. Either way, the outcome is sure to be costly. Mercury glass knobs were popular in the Greek Revival era. Before the 1800s, function, not fashion, dictated the design of architectural hardware. Hand-forged iron hinges, latches, and heavy rim locks offered utility as well as security. Local blacksmiths forged strap hinges and thumb latches of imported English iron for these early postmedieval structures. One of the most common hardware designs was the Suffolk bean latch, named for the handle plate and the region of England where it originated. Blacksmiths varied the design by forging hearts, spears, and tulip shapes for the handle plate. Heavy strap, H and HL hinges supported these early doors. With the advent of better building techniques in the 1700s, the Georgian style flourished, and the grandest homes imported brass from England. 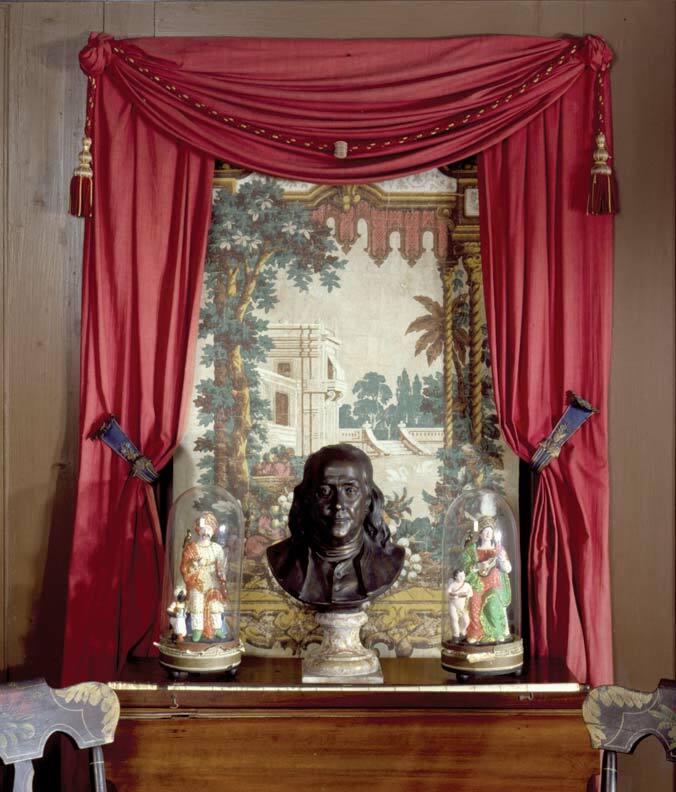 Introduced in the mid-1800s, the Greek Revival style emerged, as well as pressed glass, and colorful pressed glass knobs began to appear on interior doors—blue and amethyst were popular colors. Another ubiquitous knob was the mineral knob or, as you might know them, the Bennington knob. Architectural hardware blossomed in the late 1800s in both America and Europe. The industrial revolution, new house designs, and Victorian aesthetic sensibilities gave rise to a decorative hardware makeover. Innovative casting methods enabled companies to mass-produce hardware at affordable prices. With the new sand-cast technology, companies could produce hundreds of pieces a day compared to what the local blacksmith could produce. In 1869 in the United States, the Metallic Compression Casting Company was awarded its first design patents for decorative hardware, and by 1872 many companies had designers on staff to create ornamental hardware. Inspiration came from every corner of the globe and from every historical period. The Byzantine Empire, Colonial America, sixteenth-century England, Amsterdam, ancient Egypt, and China were just a few places tapped for their aesthetic sensibilities. 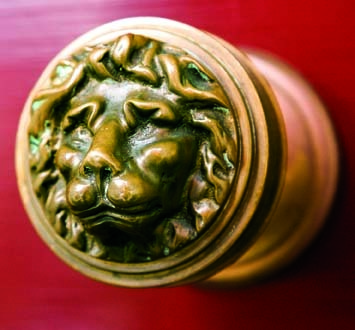 A Victorian-era doorknob boasts a lion&apos;s face on the handle. At the end of the nineteenth century, housing styles changed yet again, with the United States recently celebrating its centennial, and the building industry looked back to revive past house styles. 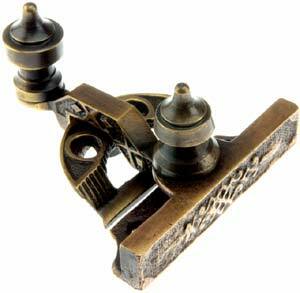 Simple unadorned brass and wroughtiron hardware were also introduced. Architects, builders, and kit-house purveyors also introduced Tudor, Spanish Colonial, and French Norman styles. The hardware found in these houses was rustic, charming, and made of iron. Influenced by England’s William Morris and America’s Gustav Stickley, the Arts & Crafts movement introduced a new house style as well as a new philosophy in house design. Morris challenged the English Victorian society to have “nothing in their homes that they do not know to be useful or believe to be beautiful.” And this philosophy reached right down to the doorknob. Doors adopted a rustic hand-hewn, hand-finished appearance—whether they were constructed by hand or not. Custom doors would often feature oversized wrought-iron hinge straps. Arts & Crafts doors drew on preindustrial metals such as bronze, brass, copper, and iron, while rough surfaces simulated hand hammering or ancient casting. Designs also took on rectilinear forms and geometric shapes. Architectural Hardware is published by Quarry Books.